CCSS.ELA-Literacy.WHST.11-12.2 - Write informative/explanatory texts, including the narration of historical events, scientific procedures/ experiments, or technical processes. 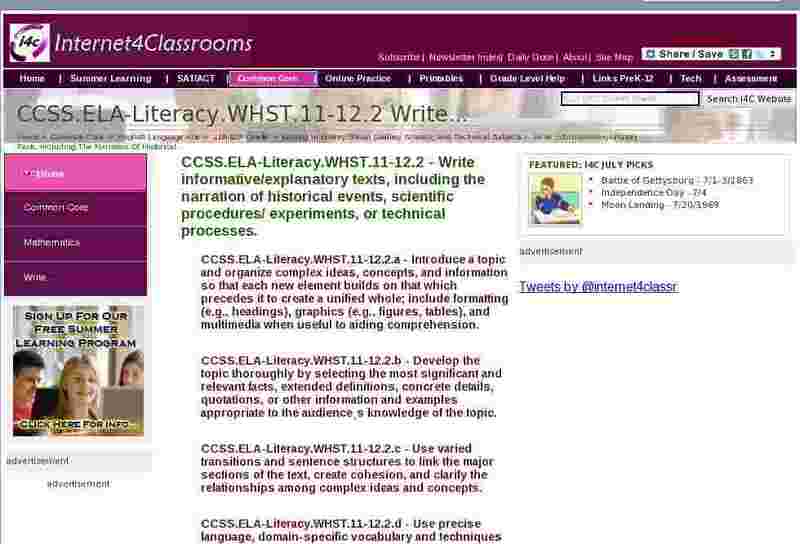 CCSS.ELA-Literacy.WHST.11-12.2.a - Introduce a topic and organize complex ideas, concepts, and information so that each new element builds on that which precedes it to create a unified whole; include formatting (e.g., headings), graphics (e.g., figures, tables), and multimedia when useful to aiding comprehension. CCSS.ELA-Literacy.WHST.11-12.2.b - Develop the topic thoroughly by selecting the most significant and relevant facts, extended definitions, concrete details, quotations, or other information and examples appropriate to the audience�s knowledge of the topic. CCSS.ELA-Literacy.WHST.11-12.2.c - Use varied transitions and sentence structures to link the major sections of the text, create cohesion, and clarify the relationships among complex ideas and concepts. CCSS.ELA-Literacy.WHST.11-12.2.d - Use precise language, domain-specific vocabulary and techniques such as metaphor, simile, and analogy to manage the complexity of the topic; convey a knowledgeable stance in a style that responds to the discipline and context as well as to the expertise of likely readers. CCSS.ELA-Literacy.WHST.11-12.2.e - Provide a concluding statement or section that follows from and supports the information or explanation provided (e.g., articulating implications or the significance of the topic).